SUBSTANTIALLY EXTENDED GROUND FLOOR ACCOMODATION STUNNING CONTEMPORARY KITCHEN & BATHROOM PRIVATE REAR GARDEN Rare opportunity to buy a vastly extended semi detached family home located at the head of a quiet cul-de-sac in Unsworth. Ideally situated in a popular location with easy access to the Metrolink, local schools, shops and amenities. 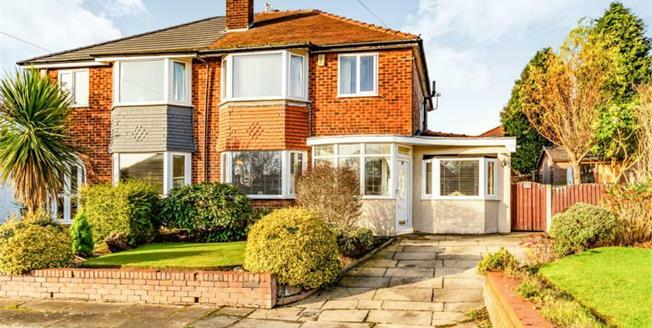 This bay fronted property comprises of entrance porch, hall, guest WC, open through lounge and modern cream gloss kitchen with breakfast bar and sitting room. To the first floor there is a recently fitted family bathroom, separate WC and three well proportioned bedrooms, the master benefitting from fitted wardrobes. Externally the property offers a driveway to the front and landscaped gardens to three sides boasting Indian stone patio and large shed with electric. Further benefits include gas central heating, double glazing, solid wood flooring and oak doors throughout. Internal viewing is a must in order to appreciate the accommodation on offer. UPVC double glazed door leading to the porch. Spacious and bright hallway with oak wooden flooring and wall light, access to the guest WC. Touch flush WC and hand wash basin. Spacious through lounge with French doors leading to the rear garden and UPVC double glazed bay window, dimmable ceiling spotlights and wall light. Oak wooden flooring throughout. UPVC double glazed bay window, ceiling spotlights and carpeted flooring. Carpeted flooring, UPVC double glazed window, wall lights and fitted wardrobes with spotlights. Carpeted flooring, UPVC double glazed window, light point, wall light. Carpeted flooring, UPVC double glazed window, light point. Modern bathroom suite inclusive of bath, separate shower cubicle with modern grey splashback panels, wall hung basin with storage unit. Additional wall cupboard storage unit, large wall mirror with touch sensor illuminating frame, dark grey feature heated towel rail, ceiling spotlights and extractor fan, tiled flooring and UPVC double glazed window. Tiled flooring to match the bathroom, ceiling spotlight, touch flush WC. Carpeted flooring, light point, large UPVC double glazed window to the side, loft access with pull down ladder and boarded.